Summer is a time to bring family, friends, and colleagues together and to share great food outside. Let’s make this season something even more memorable than ever before! A Cut Above Catering is here to help you or your business out in making sure your guests will be left merry and impressed by the end of the night. We have several picnic menus to choose from. Mix all seasonings in a smal bowl. Preheat a charcoal or gas grill to approximately 400°F. Rub steak with olive oil, and then apply spice rub. Once grill is nice and hot, grill steak for 3-5 minutes on each side, until desired temperature. Tent with foil, and let rest for at least 15 minutes. In a food processor or blender, combine vinegar, lime juice, cilantro, parsley, oregano, garlic, salt and pepper. Pulse several times and then add the olive oil in a steady stream while the machine is running. This is even better made a couple of days ahead of time. Use it to marinate meats or as a basting or finishing sauce for chicken and fish. In a deep medium sized skillet, add oil and on medium to medium-high. Cut each plantain into 3/4 inch slices. Make sure the oil in your pan is shimmering, before adding the sliced plantains. Cook the slices for about one minute on each side, until golden. Using tongs, transfer to a plate lined with paper towels. Next, locate any kind of smashing device somewhere in your kitchen. (Glasses, coffee mugs, and measuring cups are all good candidates). Just make sure it’s flat on the bottom and no larger than 3-4 inches in diameter. On a cutting board, stand your plantain pieces upright and smash them! If your plantain is sticking to the bottom, a little oil applied beforehand will help. You can also use a knife or spatula to remove those stubborn ones. Give them a second go-around in the hot oil for another few minutes on each side. They should be golden brown. Transfer to your paper-towel lined plate and sprinkle with salt to taste. In a food processor or blender, combine all ingredients until well blended. This can be made up to 2 days ahead of time. Ever wonder what wine goes with what cheese, goes with what appetizer, goes with….? 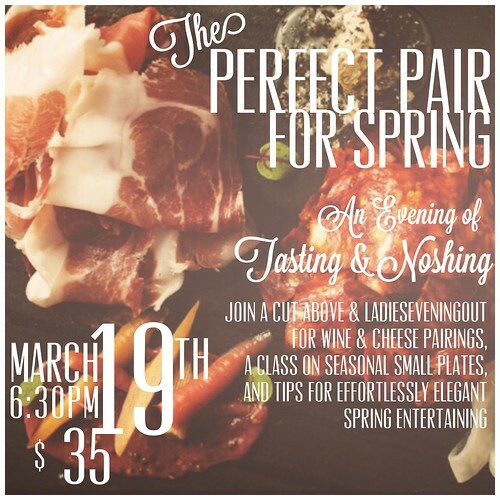 We’ll take you through an evening of tasting, sipping, and pairing with the Chefs at A Cut Above. Brush up on your repertoire of sommelier vocabulary learn how to put together a Wine and Cheese spread that would put Martha to shame. Pick up a few ideas for easy appetizers and small plates, party planning hacks, and get your connoisseur ON! Price of event includes 3 (three) small tasting glasses of wine. Additional glasses of wine will be available for purchase. To register, please submit the form below. A Cut Above Catering held their Grand Opening at their new location: 12955 Old Meridian Street, Suite 104 Carmel, IN this week. Check out the exciting photo from our ribbon cutting. The ACAC crew is clapping their hands, whistling and cheering for Amy and Kristen for a fantastic job on Indy Style this morning! If you missed their segment, here are the videos below. Don’t miss out on the cooking expo this weekend too!